I love thrift stores. When in the states, I do my clothes shopping at St. Vincent De Paul's and Goodwill. So the first time I moved to Madrid, I was worried that I would have to buy new, expensive clothes - or none at all during the year. 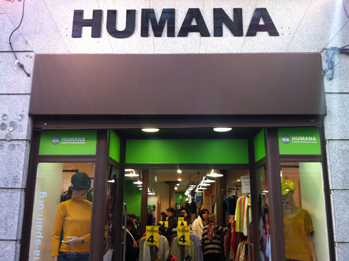 Then a friend told me about Humana, a used clothing store in Madrid. Hurray! Humana is an NGO with projects in sub-Saharan Africa, South America, and Asia. Humana collects and sells used clothing in order to fund its projects. There are multiple Humana shops in Madrid (and elsewhere in Spain! ), and numerous donation bins all around the city. The first time I went to Humana, it was 4 euro day; every item in the store cost only 4 euros, just for that day. I was amazed! (And shopped!). Jeans, sweaters, coats: 4 euros. Imagine my surprise that a few days later I happened upon 3 euro day at another Humana. Amazing! Throughout both my years living in Madrid, I was a regular shopper at Humana. I even had a punch card! In fact, I also visited Humana shops when traveling: one in Sevilla, and I went to two different Humana shops in Barcelona! Point being, Humana and I are great friends. I'm actually surprised I haven't explicitly blogged about Humana until now, apart from my post about the first two times I went there back in 2009. And at the end of both years, while packing my suitcases to return to the states, I always had a huge bag of things I donated to Humana. You can donate clothes directly at the store, or put it in any of the donation containers around the city. 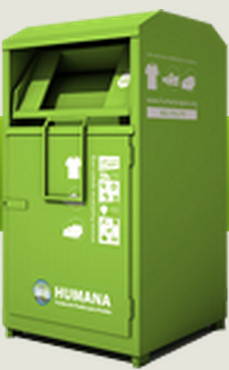 There are 5,000 Humana donation bins in Spain, and that link will help you find the closest container to you! There are currently 12 Humana shops in Madrid, so visit as many as you'd like! (There are 2 in Sevilla, 2 in Granada, and 12 in Barcelona). Hi there! I'm not sure, because there are currently 20 stores in Madrid (8 more than when I was last there), but the three I've been to were all pretty similar in size. If I'm remembering correctly, c/ Rios Rosas, 31 has a downstairs as well, and c/ Alcalá 171 was a decent size (one floor only). Thanks for sharing the detailed information about used clothing store in Madrid. I have a question for you. Did this shop is selling products online and it have refund option? Hi Andres! To my knowledge, no, Humana does not sell products online. I'm not sure what their return policy is, but you could ask in any of the shops. Good luck!